For best results, we recommend hand washing your Spanky in mild detergent and warm water. Line or hang dry. Machine washing is acceptable, but hand washing is best to maintain the integrity of your Spanky and make it last for years to come. Is the Spanky treated with no-fog chemicals? No. The Spanky is not treated with any chemicals. The “trick” to the Spanky is the special micro-weave we use in our high tech fabric. The high quality fabric will gently and effectively clean the smudges off your lenses and screens. The lack of chemicals also ensures that your Spanky is safe to use on computer screens, TV’s, iPads, and cell phones. I see a Spanky I want to purchase on your resort list, but why can’t I find it in the online store? Some of our ski resort Spankies are “exclusive.” This means that for licensing reasons, they are only available for purchase directly from the resort-owned stores. 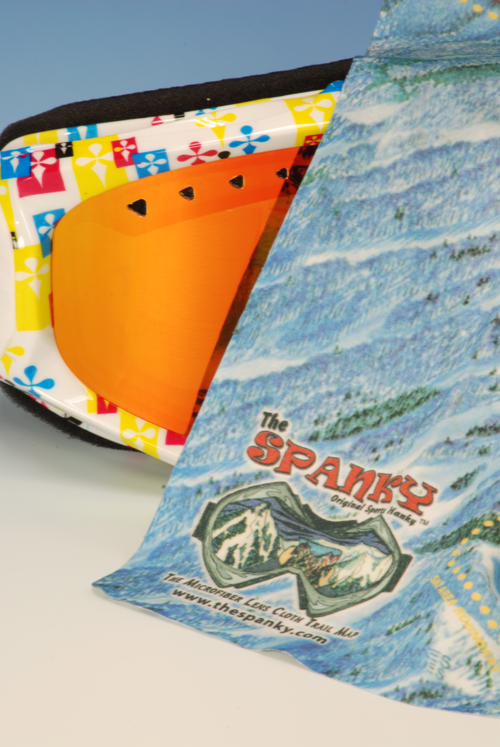 If the Spanky you want is not available in our online store, please contact the resort and inquire about purchasing a Spanky, or pick it up on your next ski trip. If you have difficulty with this, let us know, and we will do our best to assist you. Can I create a custom Spanky for my business? Yes! We are happy to work with you on creating a custom Spanky for your special event , recreational area, or to promote your business. For more information, please visit our Custom Spanky Page. Do you make the Spanky with designs or maps that are not ski resort related? Yes! We make the Spanky for a variety of markets, with and without maps. If you want to create a logo custom Spanky to promote your company, or if you represent a business or market that already uses maps and are ready to upgrade from paper to the reusable microfiber Spanky maps, we would love to work with you! Click here for more info. I love the Spanky and want to be a part of your team! Are you hiring? We are always on the lookout for individuals who would be an asset to our team. If you think this might be you, please send a cover letter and resume to info@TheSpanky.com. Does Spanky Sports offer products other than the Spanky? We currently offer one product – The Spanky, Original Sports Hanky. However, we have some exciting new products we are working on and look forward to sharing these with you in the near future. Stay tuned! Why is your lens cloth/trail map called The Spanky?